Audio-Technica is one of the premier manufacturers of headphones, especially some of the best over ear headphones available in the market. They do not have fancy packaging or outstanding design, but the quality delivered by their cans is unmistakably brilliant and has been the gold standard for quite a number of audiophiles who like these values for money headgear more than any other brand. So what happens when Audio-Technica sets out to make some of the best noise cancelling headphones ever? The Audio-Technica ATH-ANC7 headphones are the outcome. 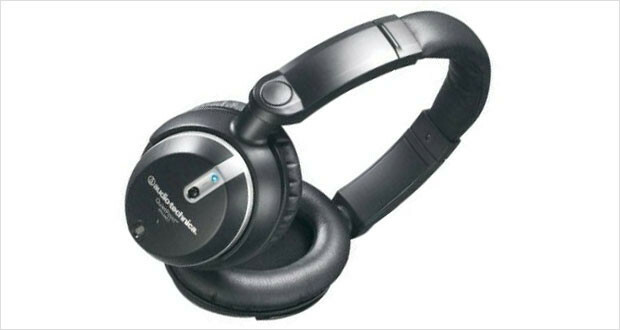 These cans are one of the larger active noise cancelling headphones with a non-foldable design that is more durable. However the included travel case and air-plane adapter adds to the travel-friendliness. The sounds are quite top notch from this pair of headphones and are as expected from Audio-Technica. The treble sounds are a little more prone to breakage in certain genres of music, however, but it does not detract wholly from the experience of these headphones. The Active Noise Cancellation works wonders even in the loudest of situations. The headphones are not entirely sound-leakage-proof however, and there is a chance that you may disturb your neighbours at medium to high volumes. The large circumaural pair of ear cups is indeed extremely comfortable as advertised. These are the pair of headphones you would like to wear over your ears on a long plane journey. The headphones are designed in a very ergonomic fashion with muted tones that scream elegance. These are the kind of headphones you would like to wear everywhere. Dimensions10.2 x 8.5 x 4.8"
While it is made of hard plastic and not fancy metal, the headphones are still adequately padded and well tested to ensure that they deliver very well without breaking into a million pieces just because you touched them at an awkward angle. The padded headband and the plush foam of the ear cups is incredibly comfortable and is made for extended wear. While brilliant, there are considerable and significant breaks in the high response in certain genres and songs. Very well defined and enveloping midrange frequency response. Thumping bass that is both deep and well defined for a wonderful listening experience. Brilliant reduction in ambient noise – a plane’s roar becomes nothing more than a loud whisper if you are sitting near the tail. The overall performance of these headphones was quite excellent in all segments – Audio-Technica does know how to make good headphones. The Audio-Technica ATHANC7 headphones are easily one of the best noise cancelling headphones available today at a very wallet-friendly price. These exude quite confidence and great sound quality if you overlook a little bit of scratchy treble responses. If you want the perfect sound, then these may not be the best headphones for you – but if you want a quiet and comfortable experience and cannot get a QuietComfort then these should be the headphones you should be paying attention to.